Latif Bolat performed at Ruhaniyat in Mumbai in November. 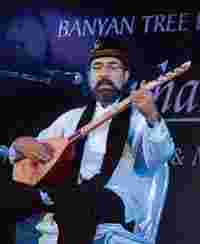 Practically inseparable from the Sufi tradition—with its message of mystical union with the divine, and its tolerant and syncretistic approach to religion—are the diverse traditions of Sufi music cutting across many cultures. “Sufi music is sung in Iran, Iraq, Egypt, Syria, Turkey, Morocco and Indonesia," points out Mahesh Babu, the organizer of Ruhaniyat, the annual festival of Sufi music which comes to Delhi on Saturday as part of a seven-city tour. It is, of course, also sung in the Indian subcontinent in many different styles, all of which have much in common with each other. Ruhaniyat will showcase some of this richness of Sufi music traditions—both locally and internationally—featuring among other things, “pure Sufi qawwali, Rumi’s poetry, Punjabi sufiana kalam, and Sufi music from Rajasthan," says Babu. Parvathy Baul, who sings in Bengal’s baul tradition of devotional music, has been participating in Ruhaniyat since the first concert in Mumbai eight years ago. “It spread slowly," she says, recalling the small numbers in the audience in the initial years before the festival caught on. “Now many people come." Babu too is encouraged by the festival and Sufi music’s growing popularity. “In Mumbai, our tickets sold out in two hours," he says. “And the audience is a mix of young and old." Taking Sufi music and its message of peace and a mystical relation with the divine to a bigger audience is one side of the coin; the other is providing encouragement and support to the musicians. “We have had musicians who hadn’t seen a train," says Babu. “They are excited to have this platform where they can showcase their skills and are also excited about the fact that their music is getting respect." He adds that four-five groups first featured in Ruhaniyat went on to tour in Europe and have received recognition and financial support from the government. The traditional arts have deep roots and there exist many pockets where they are vibrant. Parvathy admits that music concerts in cities at best provide a glimpse of traditional art forms. For an authentic experience of baul music, she suggests going to the villages in Bengal and watching a festival “unfold over three nights". People in rural Bengal take pride in the fact that their village has a baul singer, she points out. But this in itself is a sign of how things have changed. Earlier bauls were itinerant singers, now they stay put at one place. Parvathy accepts that change is inevitable and adapting is the key to survival. “We have to move with the reality," she says. “If you go out in the traditional way and start singing, who will hear your ektara? There is so much noise now." But adapting has its limits and Parvathy draws the line when people try and fuse baul music with jazz and rock. “It is ambition—people want to grow bigger," she says. “But in baul the idea is to grow ‘big’ within." She says that the trend towards using more instruments is done at the expense of the poetry in baul songs. “People say more instruments will reach more people, but what about the meaning," she says. “I play the ektara, the dugdugi and the nupur—there is no collaboration." Musical collaboration and experimentation of a different kind get an enthusiastic thumbs-up from Latif Bolat, the Turkish Sufi musician who will perform at Ruhaniyat. Bolat, who likes listening to Bhimsen Joshi and Ghulam Ali, will perform with qawwals from Rajasthan and musicians from Uttarakhand. Bolat underscores the common wellsprings of Sufi tradition throughout Asia: “Khusro, Rumi and Hafez—they all had the same idea," he says. “I find similarity in the poetry of Kabir and that of the 13th century Turkish poet Yunus Emré." He elaborates that the similarity between the two extends to the subject, the imagery and even the technical aspects of composition. When he lived in the US, Bolat used Indian musical instruments and collaborated with Indian musicians. “It is like musicians meeting in a caravanserai and sharing music in the middle of night," he says. “I have collaborated with Irish, Greek, Persian, Arab musicians. And Indian music fits—the tabla is such a flexible instrument, it is enchanting and adds colour. The Indian ragas are similar to the Makam system of music in Turkey, so collaborating is entertaining and educational too." Bolat says that he is a traditionalist when it comes to presentation. He found performing at the Carnegie hall “very formal" and, by contrast, loves the outdoor Ruhaniyat concerts which remind him of “Mughal mehfils". Babu is heartened by the growing popularity of Sufi music. He recalls his experience in Chennai—not the first name one associates with qawwali. “I thought that the mamas and mamis will want to go home by 9pm," he says. He was in for a surprise. “It was 11.30pm and they kept asking for more." 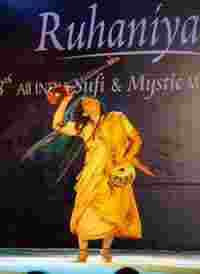 Ruhaniyat will be held at Senate Gardens, Lutyens’ resort, Mehrauli-Gurgaon Road, New Delhi, on 13 December. It will then travel to Bangalore, Hyderabad, Chennai and Pune. For further details, emailbanyantree@vsnl.net.